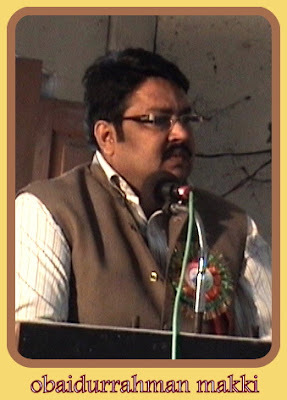 Obaidur Rahman's first book on Ghazipur “ Tazkera e Mashaikh e karaam Ghazipur” and second on “ Ghazipur Ka Adbi Pasmanazar “ received popular acclaim. Apart from writing articles and Islamic issues he wrote columns for national newspapers. 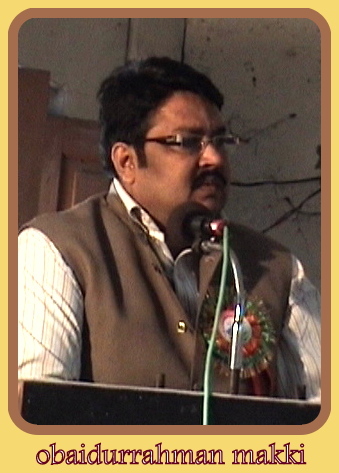 He also wrote for All India Radio,Allahabad and Varanasi. 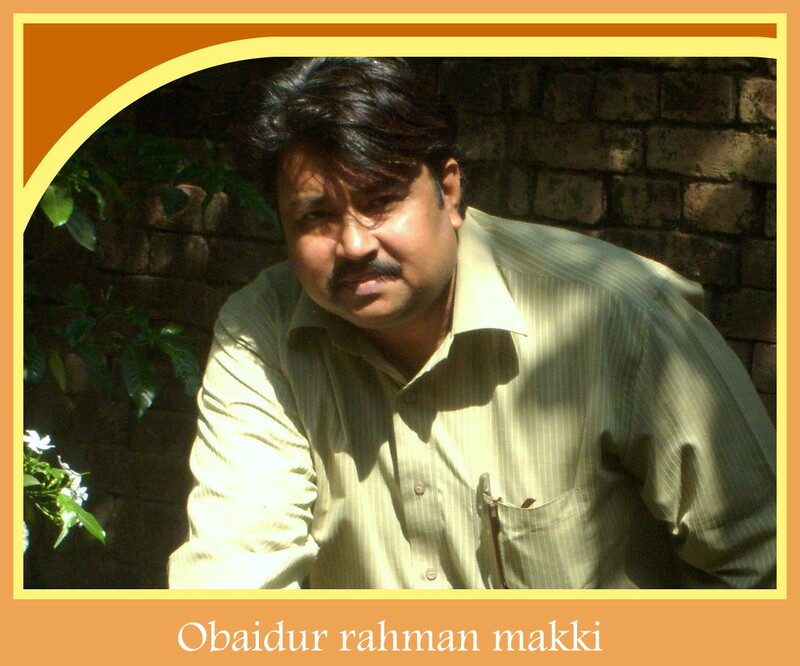 Obaid-ur-Rahman ( born 5 june 1963) in Ghazipur ,U.P.India, is an Indian journalist, writer and poet. He was involved in progressive literary movements as a young man.He has always struggled for the freedom of the press and for the rights of working journalists and other media workers. His was a remarkable new voice since the 1985s; each of his successive books attested to an expanding world of cultural discernment and harmony, which he created in prose of peerless beauty. Rahman has written many books and translations and which equally inspire for his efforts for press freedom and implementation of Freedom Of Speech. He has been recognised as "a rare breed" in the Indian Muslim media circles. Obaidur Rahman was educated at Madarsa Dinia ,Madarsa Azimia ,M.A.H.Inter College , P.G.College,Ghazipur and Allahabad university.. He has written more than 200 articles in English ,300 articles in Urdu and 100 articles in Hindi. A complete list of her scholarly and creative works is available on his website. He was inspired by Sahir Ludhyanvi, Rahi Masoom Raza,Prof.P.N.Singh,Krishan Chander and other stalwarts of the Progressive Writers' Movement since his school days. "Rahman has chosen a difficult genre of prose. It goes without saying that it is very hard to compose effective articles. He prefers thought to the word". His contributions to literary theory, literary criticism, historiography and cultural studies had a far-reaching impact as several disciplines began to be remade in the 2000s. As a result, curriculum and pedagogy underwent substantial changes, so that a paradigm shift was clearly in view. However, its full significance was not to be realized until a couple of decades later, through the period of globalization, in a world where fast communication still had to find the means to meet the twin challenge of ignorance and mis-understanding partly caused by knowledge. Rahman had begun to deal with such (what then appeared, or as he termed, hypothetical) questions a quarter century earlier than anyone else,offering sharp canonical analysis and effectively arguing for a "comparative" aesthetic to foster humane cultural norms. He showed new paths of reading the classical and modern texts, and also emphasized upon the sublime nature, position and pleasures of language arts to be shared when these were being reduced to social or professional utilities. Alongside his scholarly books and articles in journals, his series of lectures and essays in the general press (print as well as radio , Journals,and newspapers) also drew interest both for the originality of their content and their lucid prose.